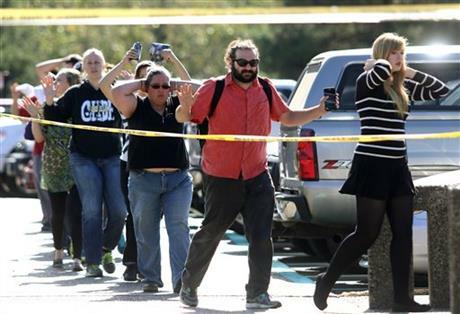 ROSEBURG — A gunman opened fire at an Oregon community college today, killing at least a dozen people before dying during a shoot-out with police, authorities said. Oregon’s Attorney General Ellen Rosenblum said 13 people were dead. It was not immediately clear whether that number also included the 20-year-old gunman. State police Lieutenant Bill Fugate told KATU-TV that at least 20 others were hurt. Authorities offered no immediate word on the gunman’s motive and said they were investigating. Douglas County Sheriff John Hanlin said the gunman was killed in an exchange of gunfire with officers. The sheriff did not say whether the shooter was killed by officers or took his own life. “We locked our door, and I went out to lock up the restrooms and could hear four shots from the front of campus,” UCC Foundation executive director Dennis O’Neill told the Roseburg News-Review. Students, staff and faculty being evacuated from Umpqua Community College in Roseburg, Oregon after a deadly shooting today. The school has about 3,000 students. Its website was down today, and a phone message left at the college was not immediately returned. 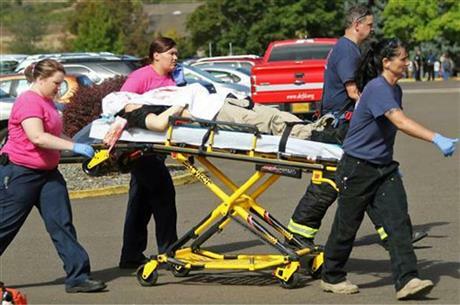 Mercy Medical Centre in Roseburg reported that it had received nine patients from the shooting, with more on the way. Authorities carrying a shooting victim away from the scene after a gunman opened fire at Umpqua Community College in Roseburg, Oregon, today. The rural town of Roseburg lies west of the Cascade Mountains in an area where the timber industry has struggled. In recent years, officials have tried to promote the region as a tourist destination for vineyards and outdoor activities.